Time plays tricks on you when you travel. I am about to board my fourth--and final, hurrah!--leg of my journey to Thailand. 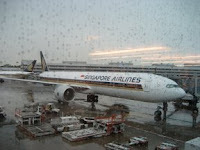 I am standing in the Singapore airport a day and a half later after I flew out of Atlanta through JFK via Frankfurt on Singapore Air. It's gray and sprinkling here. 30+ hours and still counting. I've watched four movies, nodded off periodically and ate a monstrous amount of airplane food, including two klondike bars. Next stop: BKK. Almost there.